Even the best quality footwear has a limited lifespan. Supportive shoes work hard to protect your feet from impact with the ground. Worn-out shoes are no longer able to do the job they’re designed for. It’s one thing to go out briefly in a shoe that you know isn’t supportive. Examples include flip-flops, high heeled dress shoes, cheap loafers, and ballet-style shoes. Minimize how often you wear shoes that don’t protect your feet. It’s quite another to go for a hike in shoes you think are supportive, only to experience discomfort later. You’ll feel pain because old shoes are no longer able to protect your feet the way they should. How do you know when a shoe needs replacing? 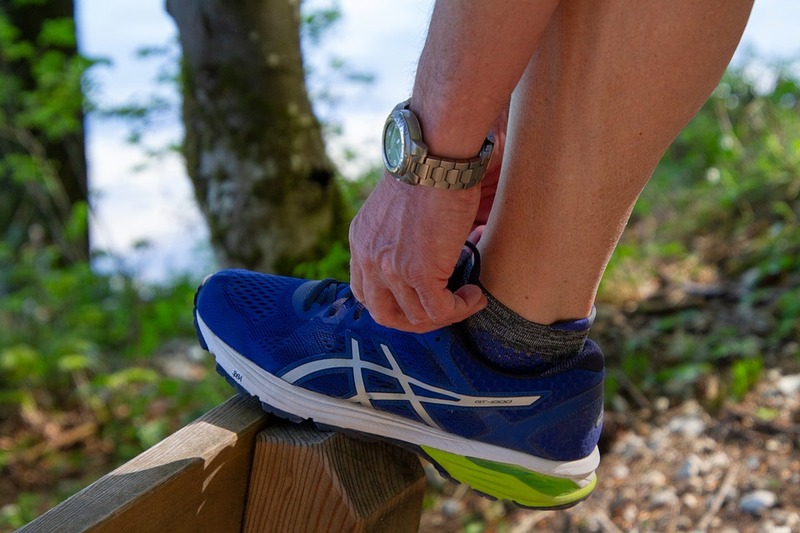 Replace your running shoes approximately every 500 kilometers. They may need replacing sooner if you run over particularly rugged terrain. If you’re a runner or jogger, you can measure your route. You will be able to determine how much distance you put on your shoes each time you run. This is harder to do if you’re wearing those running shoes on errands, wandering off-trail hikes, or day tours, unless you use a gadget to track steps or distance. Don’t worry—there are other ways to track wear on shoes. Replace your shoes when the treads wear out. Not only are your shoes losing their ability to grip, but also, the treads last longer than the shock absorbency. If the treads are gone, you will know that the shoe’s ability to cushion your feet has also been lost. Put one hand on the toe of your shoe. Put the other hand on the heel. Twist. A good shoe will be firm, and you will feel resistance. If the shoe twists easily, it needs replacement. Rotate your running shoes. Have two pairs and take turns wearing each. Buy a new pair about halfway through the lifespan of your old pair. When the new pair starts to feel significantly better than the old pair, the old ones are probably in need of replacement. Finally, listen to your body. If you feel knee pain, muscle fatigue, or aching feet after moving in shoes that used to feel good, your shoes might be worn out. What if my shoes are supportive, but I still feel discomfort? When you’re feeling sore feet, joint pain, or muscle fatigue in even the best new shoes, then it’s time to call Sheppard Chiropractic and Laser Healing at (506) 635-8182 or (506) 847-7172. If you’re active on a regular basis, you will benefit from regular maintenance care, whether you’re in pain or not. We can help you lead an active lifestyle so you feel your very best.